Two legends of Wonder Woman comics are teaming up to bring two comic book legends together this September. For the first time, Diana of Themiscyra is going to come face to face with Conan to tackle some suitably world-destroying threats that necessitates the mother of all fantastical warrior team-ups. Gail Simone will write the six-issue series for Dark Horse, with Aaron Lopresti—who previously collaborated with Simone multiple times throughout her beloved run on Wonder Woman—on art duties. 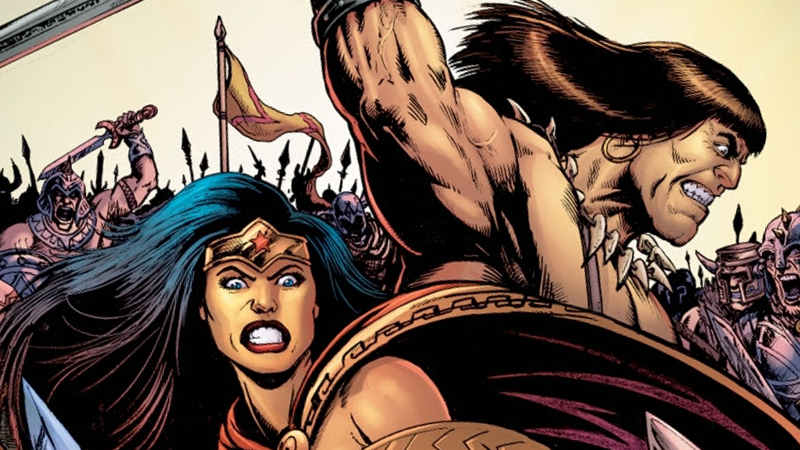 The aptly titled Wonder Woman/Conan will see Diana and Conan thrust into slavery in a strange new land, necessitating a partnership of epic proportions —not just to escape a life of grueling hardship in captivity, but also to cleanse the mysterious world they find themselves in of a dark magic that threatens to overwhelm even the two mightiest warriors in all of comics. Basically it’s six issues of Wonder Woman and Conan the Barbarian hacking the ever-loving crap out of people. What more could you possibly want? Wonder Woman/Conan is set to begin on September 20.